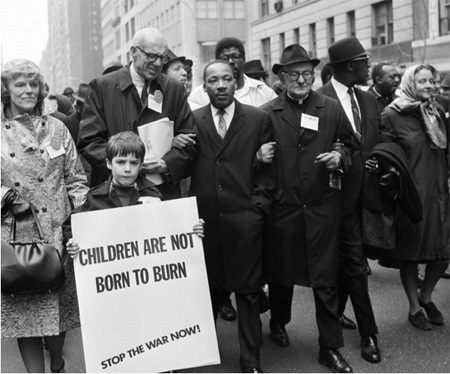 I look forward to the Reverend Doctor Martin Luther King’s birthday because every year on that day a big collection of local elected officials accompanied by cops on horses and honor guards and followed by several hundred of the despised proletariat singing We Shall Overcome, you know, the people that compose the very foundation of our society that Dr. King lived and died to lift up to prosperity, the whole bunch marches from the State buildings on Madison Avenue all the way to my neighborhood. My neighborhood! Because we’ve got the monument and the statue of the great man right here in our end of Lincoln Park, visible from my front porch. But this year the march didn’t happen because of a little snow and a bit of cold. Okay it was almost two feet of fresh snow here in the South End and the temperature that morning was -4 Fahrenheit, but so what! Dr. King faced fire hoses and dogs and truncheons so maybe these local politicians could deal with a little inconvenience on their grueling quarter mile mostly downhill stroll. And this isn’t the first time they’ve cancelled because of a little weather. Wimps! Instead the procession took place in the warm snow-free underground State plaza, marching from one end to the other or back and forth or something. I didn’t attend, nor did I attend the State sponsored program they have every year down there in that dismal theater under The Egg. Did that once, that was enough. 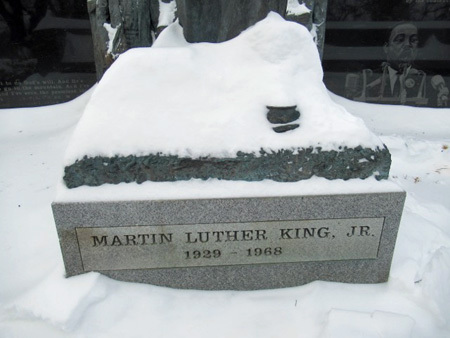 Instead I made a visit to our neighborhood MLK monument, briefly as it turned because damn it was cold. However I do indeed concede that it is a plain fact that Dr. King was born and raised in Georgia where January doesn’t ever get cold like this. 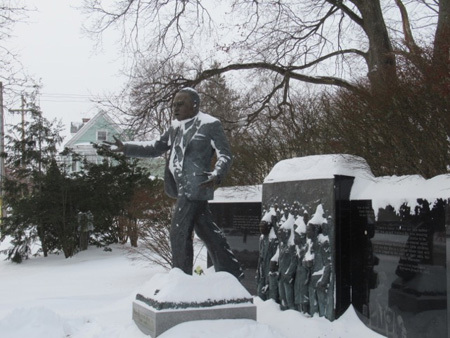 I suppose that if he ever had to show up in Albany when it was minus 4 the man would have suffered tremendously, a most undignified thing to think of him doing. In fact, or as best as I can tell in fact after a quick search, the man never visited the Northeast in the dead of winter, which was smart. He did visit New York City plenty of times though to preach at some of the churches such as Riverside In Morningside Heights in Manhattan, where he gave one of his most important speeches. That would be the one where he declared opposition to the Vietnam War and quite likely is the reason he was assassinated almost exactly one year later. There’s some photos of him marching through the streets of NYC in mid April, he seems to be bravely holding up in the springtime weather. 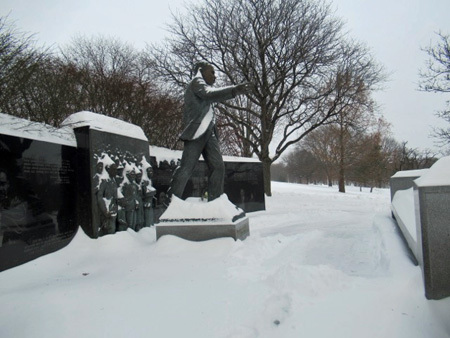 But I can’t even imagine him in real life covered with ice and snow the way his statue was covered this past MLK Day in Lincoln Park. Most of those of us who live our lives in this part of the world, suffering in misery through the winter months year after year, have had at least a few moments in our lives when we looked like that ice covered statue. There’s a reason why we all prefer to stay indoors for several months shamelessly burning large quantities of fossil fuel, ramping up global temperatures. I had no intention of joining the procession under the State plaza, the mere thought made me surly. 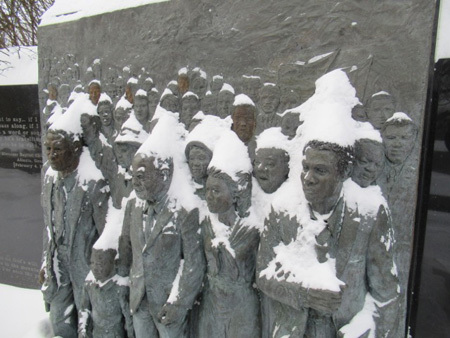 Don’t get me wrong, I’m glad the politicians did something to commemorate the man on his day and yeah, marching outdoors in this weather would have entailed a level of suffering that no one in the 1960s Civil Rights Movement had to endure ever (as far as I know!) But no, walking back and forth down there is those dingy caverns just doesn’t work for me. What’s the point? So around 10:30 AM I laced up my boots and walked out of the house into that minus four air and told myself it was no big deal I can handle this and gritted my teeth against the wind as I clumped through the snow and ice over to the monument. Holy crap it was cold. I almost hollered out loud. I’m sure I hissed a few appropriate expletives. It was so cold I forgot to congratulate myself for being so dedicated. 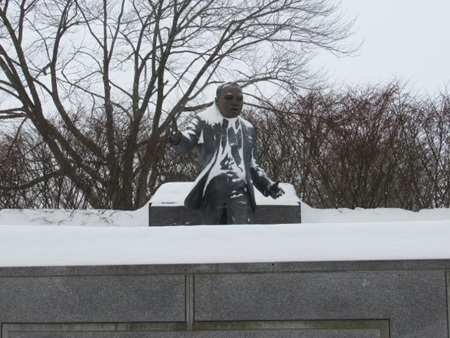 The snow and ice had been partly cleared off the monument just in front of the statue, but mostly not. But much of the area around it that had been sorta kinda plowed, including some of the grassy area in front. On Friday before the weekend I’d seen the Department of General Services guys over there cleaning up and getting it ready, and earlier this week the DGS sawhorses used to block traffic for the march had been deposited on the corner. This annual January spruce up is usually the best one shot maintenance the monument gets all year. 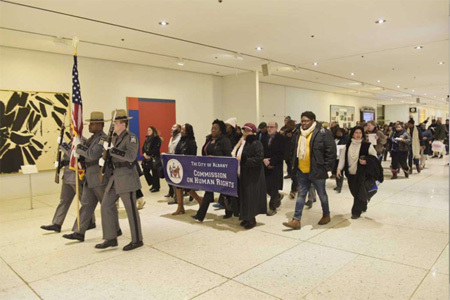 The march had been cancelled by official decree from the mayor late Friday afternoon because the weather reports for MLK Day were already dire. In this age of little faith the confidence placed in the weather prognosticators is remarkable, science I suppose. As it turned out, their big computers reconciled the NWS and European models of software well enough that their predictions of big snow followed by terrible cold were right on the money. I was alone with Martin. A couple of cars were parked off to the side but I couldn’t see anybody inside them. There was a trail of recent footprints in the snow in front of the monument before I added my own, but that was it. Someone else was brave or maybe crazy enough to come out here in this rotten weather but that person was long gone. 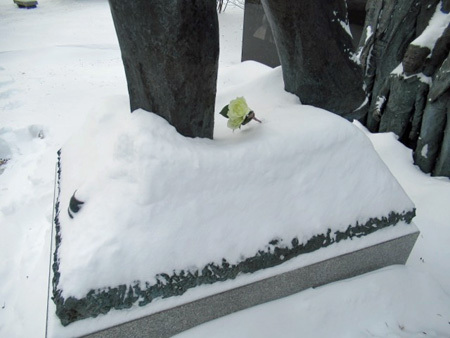 Then I noticed that person who had made the footprints had poked a single yellow rose upright in the snow at Martin’s feet. I reached to touch it to see if it was artificial and to my surprise a little piece of a petal snapped off where my finger met it. It was real all right, utterly and completely frozen like the statue above it. Now understand that I was taking pictures with my little camera like I do every year whether anybody shows up to honor Martin or not. However, to operate this device I have to pull off the glove of my right hand, exposing my sweet delicate finger flesh to the horrible air. Within minutes I was seriously worried about frostbite, that my poor hand would end up like that yellow rose and pieces of it would snap off. So I didn’t take as many pictures as I wanted to. Most years I circle around the monument trying to catch all the angles and catch all the action, that is, most years when there is some action to catch. But I wasn’t about to crunch through the two feet or so of snow behind Martin and possible die of exposure and never be seen again. Or watch my fingers fall off and land upright poking out of a snowdrift. Thus I grudgingly conceded that maybe it was a good idea to cancel the outdoor ceremonies, clearly only crazy people would venture out into this if they didn’t have to. And not for the first time I wondered why anybody would voluntarily choose to live here during the winter and also wondered why I moved back here after living in California where they declare an emergency when the temperature hits 32 degrees F. So I shoved the camera back into my coat pocket, pulled on the glove and headed back to the house. Safely inside I put my frozen hand on the big cast iron radiator in the living room and left it there until I could feel it again. It’s amazing, I hadn’t even been out long enough for the camera to stop working because of the cold, yet I was approaching frostbite. Yeah, I really like these big iron hot water radiators that you find in older downtown Albany houses, they are absolutely the best way to heat a house. I think David Brown is a Racist against his own people. You are correct. But It WAS cold, really cold. I was at a funeral the day before and THEN dug out the car. Monday I didn't leave the house.